Old backwoods, many hours spent on your own, historic hydroelectric power stations, barrier lakes and a charming health resort – these are the attractions offered by Słupia. 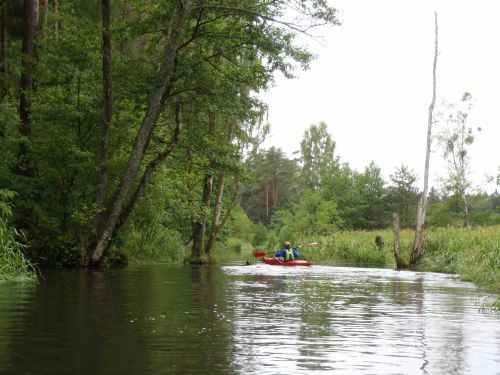 The river has only three tributaries available for canoeing but in connection to oxbow – Stara Słupia (Old Słupia) there are few options of determining the route with different levels of difficulty and different landscape aspects. We recommend Słupia at any time of the year and if you enjoy mushroom picking choose late summer or early autumn, because there is plenty of mushrooms in this area. When we pass the entrance to the port you will feel as if you succeeded again! Wierzyca runs through Kociewie, which is not less attractive than Kashubian area itself and surely offers many incredible objects: castles, churches and palaces situated right upon the water or nearby. And one cannot ignore what nature and river have to offer: wild break-through, countless meanders and breath-taking bays. 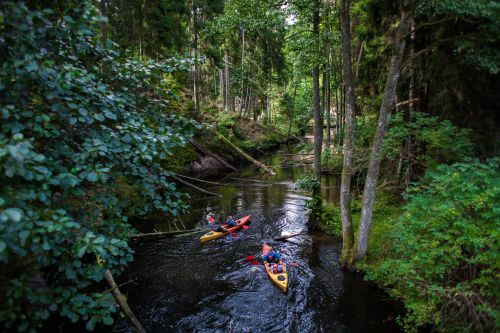 You can be sure Wierzyca will make your kayak dreams come true. Going down Wierzyca is a real expedition to the unknown; this route, which used to be forgotten, will provide you with adventure which allows you to feel like real pioneers. Why highway? Because it is safe, comfortable and very long. It runs through great forests, a great lake, a great bay. 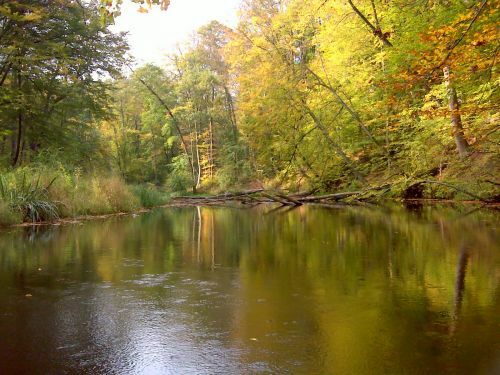 It will present you landscape and natural treasures of Kashubian and Kociewo. As well as the beavers. 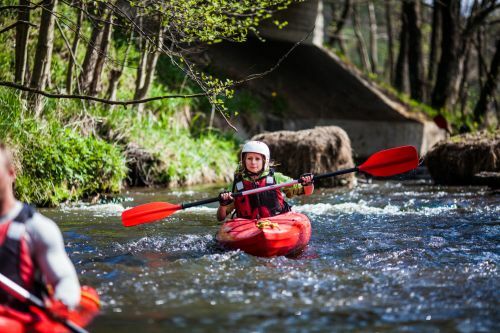 Brda, also known as the Queen of Borowiackie Rivers, is a dream-come-true route for people who just begin their adventure with canoeing. 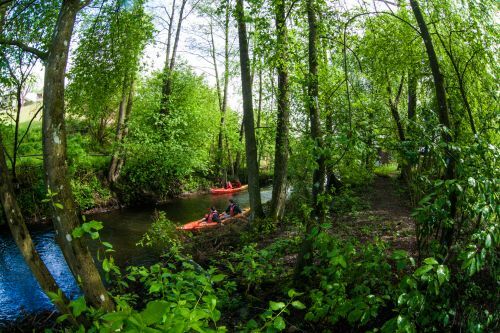 Canoeing down Brda offers us everything there is to be offered: trawl that is quite easy to cover, perfectly signposted route, developed infrastructure in a form of accommodation and campsites. But that is not the most important aspect. Canoeing down Brda is extraordinarily charming. Brda route does not only mean river-related sensations – Brda will take you to beautiful, big lakes and lead through great forests. 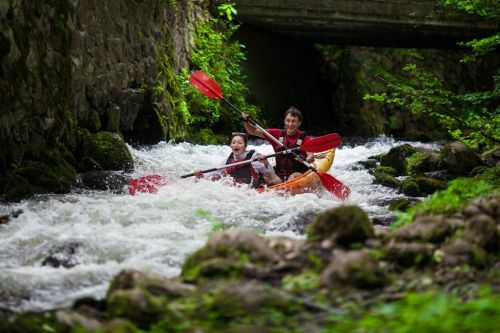 If you are just starting Brda will make you fall in love in kayaking and force you to come back to this very place when you become a kayaking expert. The route is 21 km long – 21 km of water (and for some underwater as well) adrenaline. Łeba is a river which surprises with changes – it delights with moraine shafts and mountain-like character to run quietly a moment later through the vast coastal plain. But best of all is what takes place in the end - at the mouth of the river there is an unique lake with “traveling” sand dunes. Kayaking on Radunia is an unforgettable experience due to beautiful landscape. 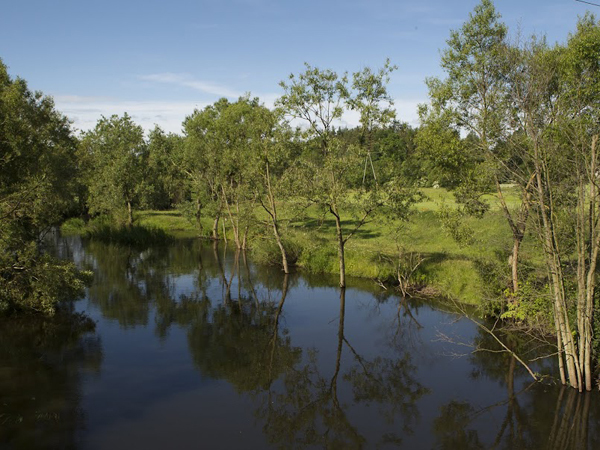 Discover most charming corners of the Kashubian Lake District - high hills, deep ravines and clean lakes. 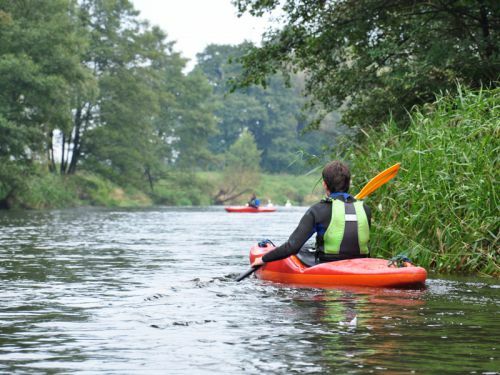 People from Kashubian region say this river is a beating heart of the lake district. Check it out for yourselves. Kamienica is one of the four major tributaries of Słupia. 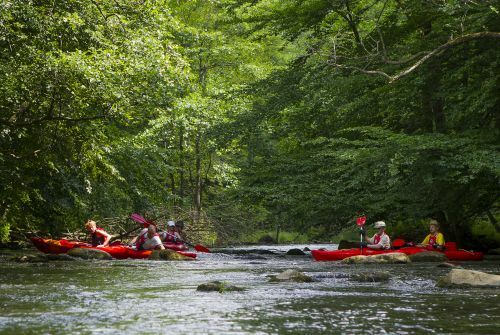 If you are going on your first kayak trip or think about canoeing in a double kayak - now go to another bookmark on our site. Studnica a left tributary of Wieprza. 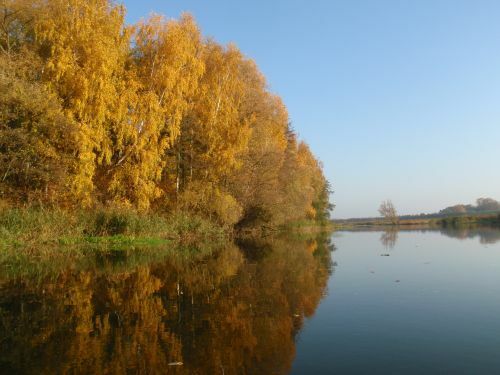 Its sources are located in the western part of Lake Bytowskieg (Pomeranian voivodeship), southeast of Miastko. The river originates approx. 8 km before Miastko and flows out of the lake near the village of Słosinko. Then flows through the lake Studzieniczno and moves towards Miastko. Mouth of the Wieprzy is situated in the vicinity of the village Biesowice. Skotawa is not a water highway - sometimes it requires reflexes and experience. There were the ones who have stared at the beautiful pristine landscape and have suddenly realized that the canoe is speeding three times faster and straight on a fallen tree. It is worth coming here! 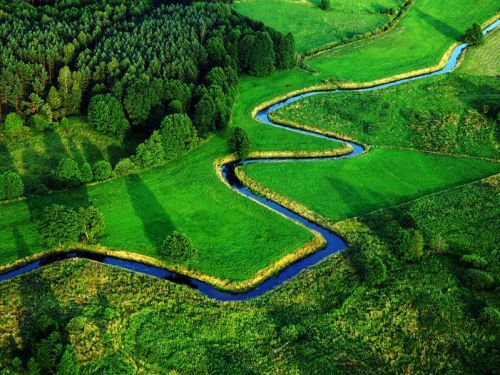 Zbrzyca is the most beautiful of the tributaries of Brda. The route, almost on the entire length, passes through magnificent forests and several lakes. 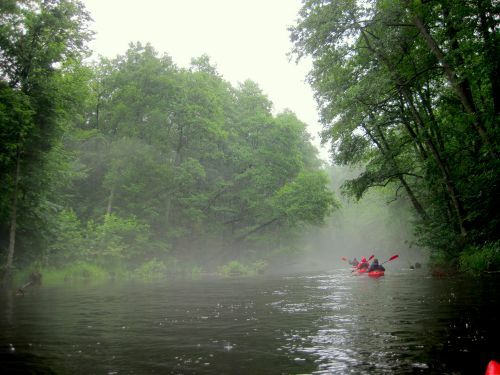 Kayakers enjoy the Zbrzyca due to its picturesque landscape and variety. 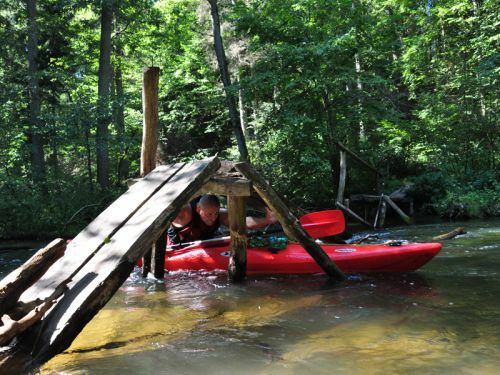 These are sufficient arguments to face few episodes of carrying the kayak near charming mills, weirs and wood mills. This river and its surroundings get more beautiful with every kilometer. 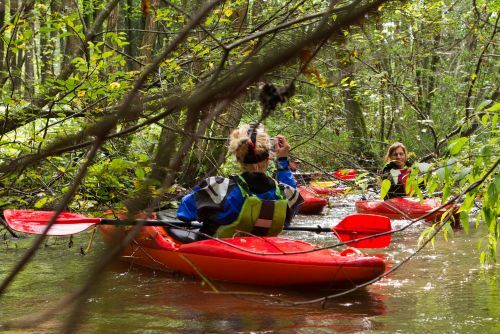 It is a perfect introduction to canoeing down Brda. 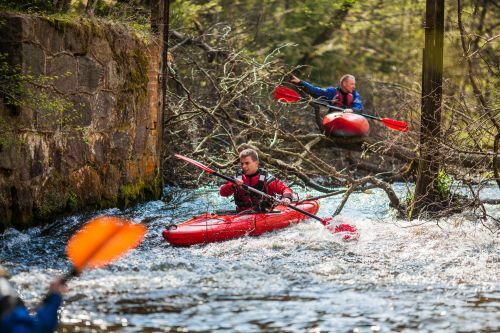 Bytowa route is easy, well-suited for novice paddlers, still extremely wild and picturesque. 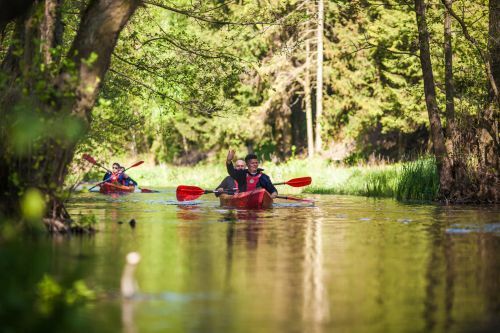 Lack of development surrounding the river and the fact that it is rarely visited will allow you to fully enjoy the untouched flora and fauna of the Kashubian region. This is without a doubt the greatest strengths of Bytowa. Residue left after adjustment attempts are interesting to - water thresholds and strengthen edges destroyed by the river. There are few hours with nature ahead of you.